Before the fall storms on the East Coast get awful, invest in some preventative tree care. Before the fall storms on the East Coast get awful, invest in some preventative tree care. If you live in Maryland, Virginia, or Washington D.C., then you should be familiar with the weather that the change in seasons bring to our area. Fall storms can damage and even destroy your trees. Here is some more information about why preventative tree care is so vital. The first part of proper preventative tree care is pruning regularly. Regular, well-timed pruning and maintenance will keep your trees healthier for much longer than you might expect. Pruning can help reduce the effects of lightning damage and other storm fallout. Windsail reduction is the specialized technique experienced arborists use to reduce wind damage inside the tree’s canopy. Addressing windsail damage will help trees survive windy nights and powerful storms. Don’t forget to care for the roots of your tree! The roots of the tree are just as important as the branches or the canopy. Soil saturation can be bad news for your tree. If the roots are too weak, the tree may be in even more danger of toppling. 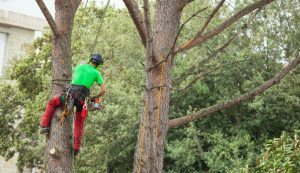 If you think your tree is too badly damaged to remain standing upright, consider tree removal services from Nelson Tree Specialists. Can you tell if your trees at at-risk? This task may not always be the easiest to complete. If you think your tree may be in trouble, get a second opinion from us. A diagnosis can determine the overall health of your tree. You will probably be better off if your ailing tree is removed from your property before it could fall over. If your tree falls over, it could cause catastrophic damage to your home or your car. It might even fall on you, your family members, or your pets. Keep everyone safe this fall and work to save any sick trees. If your trees are beyond saving, it’s time to let them go instead. Tree Care Tips and More from Nelson Tree Specialist! This entry was posted on Friday, September 29th, 2017 at 11:11 am. Both comments and pings are currently closed.